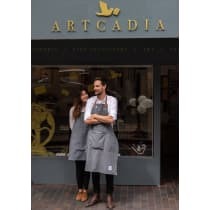 Artcadia, a letterpress stationery shop and design studio in Shrewsbury, is the passion project of couple Vici and Adam Blenkharn. After spotting a gap in the local market for beautiful paper goods, they decided to open their own boutique specialising in just that. Quality is the core of Vici and Adam's ethos, and many of their products are produced in their studio using vintage presses, before being finished by hand. "We are creative people and we like doing our own thing. We love that owning a boutique allows us to curate fantastic products made by like minded brands that share our ethos."